Hand cut various hot air balloon shapes on quality wood at varying sizes, then sanded and primed them. Using a palette of bright colors to pattern the 30 cut balloons, I was able to ensure that each piece was unique and provided dimension. Next, I sourced wooden baskets of varying sizes, and hand cut them to proper size in relation to the balloons, and added holes that would allow each one to be hand threaded with rope to secure the baskets to the balloons. The pieces were then applied to the walls via a custom-designed spacer and a screw system, bringing an element of depth to the project. Custom hot air balloons with “available” and “occupied” indicators were also created for each of the three family meeting rooms. 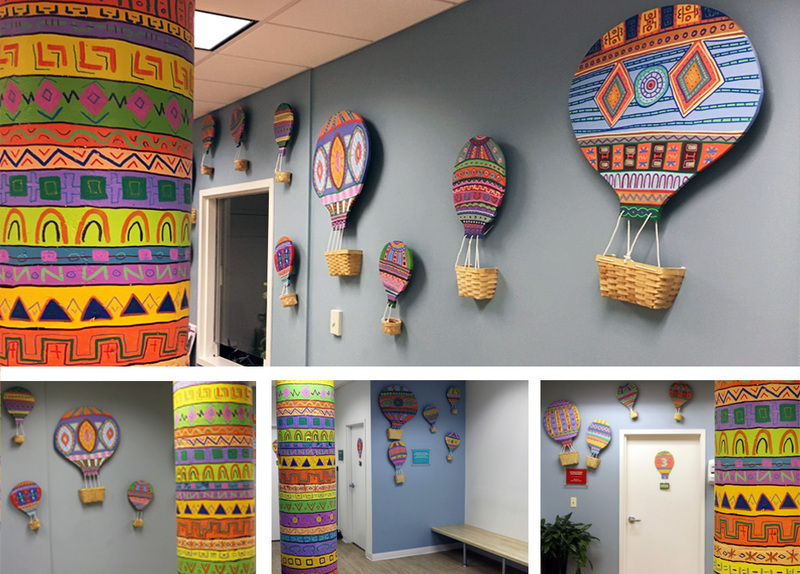 Finally, over the course of two nights, a large, concrete pillar in the center of the waiting room was painted to match the style of the balloons. The idea here is beyond providing visual interest through the installation of the art pieces—the actual baskets can be used in varying interactive ways. For instance, children can work with a counselor to write out a wish and add it to a basket, or they can draw out a frustration, add it to a basket and have it “carried away.” Alternatively, some baskets have inspiring fortunes added to them. Serving Illinois since 1867, Lutheran Social Services of Illinois (LSSI) is a nonprofit social service organization of the three Illinois synods of the Evangelical Lutheran Church in America (ELCA). LSSI is the largest statewide social service provider, serving over 70,000 people across Illinois last year. The demographics of clients served by LSSI generally reflect those of Illinois’ population, with one important exception—more than 80% of clients report an annual household income under $15,000, compared to just 12% of all Illinois households. The organization provides critical programs for the state’s most vulnerable residents including foster care, mental health services, alcohol and drug treatment, affordable senior housing, residential programs for people with developmental disabilities, and programs that help formerly incarcerated individuals integrate back into society. Lutheran Social Services of Illinois, Foster Care Branch provides supportive services for children in need and their families. Foster care services focus on placing children who have experienced neglect or abuse into a loving and secure home. Children’s Community Services offers numerous other services to at-risk children and their families in their communities.